Wow, I can't believe that Saturn's moon Titan has an ocean!!! Its a little late in the game getting on the list. Europa and Ganymeade were discovered to have'em years ago. The interesting thing about Titan, the water there serves a function more comparable to what magma does on Earth. All those rocks near the Huygens landing site? Ice, frozen to a point where its harder than granite. Fun place, if you've got antifreeze for blood. I guess we all must to consider this fact: othrer planets requires other life ways, forms etc.? The same must be truth on the "rest of the universe". Inácio de Freitas [from Brasil]. I think its really cool that science has come so far that we can send spacecrafts to saturn and figure out the ocean beneath the surface. I think that this discovery will help scientists figure out how earth has evolved and continue to change over millions of years. James, so what is the relevance of NASA's mission exploration priority in this context. Titan had an ocean long ago also -why does it matter if we just discovered it? The surface of Titan and Ganymede are also frozen to the point that they are harder than granite. What is th point of your comment? Antifreeze is necessary throughout the outer solar system, but that does not deter robotic spacecraft from exploring. Titan is extremely rich in organics – the other astrobiological necessity. Don't rule it out without a closer look. Some questions should be answered, if Titan has and internal ocean, what is sustaining it? Internal pressures, internal dynamic heating, or tidal flexing from Saturn's gravity? Does Titan have an active core, and since Titan is very planet-sized for a moon, does it have its own magnetic field? Ever notice the similarities between Titan and Venus? Both have thick atmospheres and surrounded by sun-blocking clouds. Venus is 900 degrees on the surface, while Titan is -300 F. What is making Titan so cold? 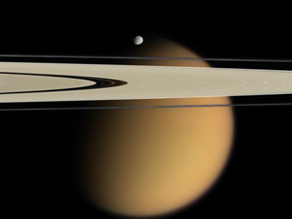 Why is it that scientists' reason for the sky on Earth being blue is because of nitrogen rayleigh scattering, when 95% of the atmosphere on Titan is nitrogen, yet the sky is orange? I don't buy the Uranus Neptune color argument either. They both have large amounts of hydrogen and helium and some methane, but one is aquamarine, the other blue, why is this? Nice staying visiting your web site again, it is often several weeks to do. Very well this particular content material that ive been recently continued to wait for so very long. I need this kind of write-up to help extensive my own mission inside university, and it has identical theme jointly with your article. Thank you, beneficial reveal. Wilshere re-elected to the team list, against Arsenal and he is the good news. But Wenger is not too much said, because it knows that after such a long period of rehabilitation cycle, the England midfielder is difficult to immediately return to his best. Jack did not participate in the 14 months game time, still working very hard, he did very well but we can not be too too hasty. "Wenger said: Although traditionally cautious Wenger is unlikely to make Viagra Er Xieer starter, but the possibility of this talented midfielder came off the bench still very large.